Gift Cards: Amazon, Wal-Mart, Bass Pro Shops, Applebees, and much more! 1X Points on every other purchase! 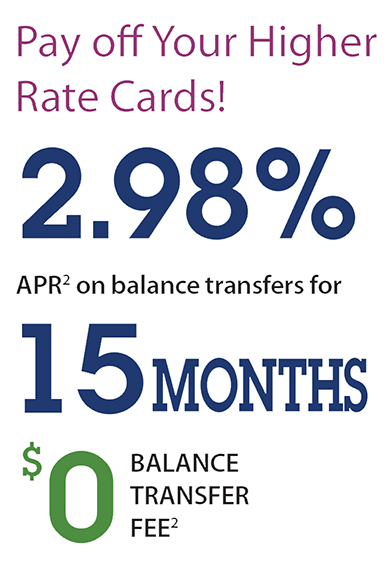 Get 2.98% APR2 on balance transfers for 15-months, all with a $0 balance transfer fee. Save on interest and pay your balances down faster. You'll also receive 10,000 Reward Points1 when you spend $1,000 in purchase transactions within the first three months of account opening. For the first six months from account opening, pay only 2.98% intro APR2 on purchases! Would like to speak directly with an Infuze CU lender? Call 573.329.3151 to get started. Prefer seeing us in person? We'd love to talk with you at any branch location. Or, send us a message, and we'll get it to an Infuze CU lender who can assist you. Redeem your points by visiting CU Rewards. Login or register all in one place - it's that easy! 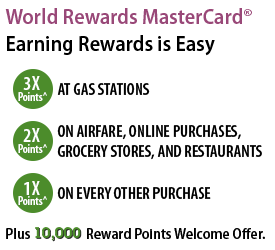 Points can be redeemed for travel, gift cards, merchandise and much more. Visit CU Rewards to get started today! Should you find a lower price for an eligible new item within 120 days from the date of purchase using your eligible MasterCard, you may be reimbursed for the price difference. For more information about the coverage, you may be eligible to receive, call 1-800-MasterCard. To file a claim online, go to www.mycardbenefits.com. Certain terms, conditions, and exclusions apply. See your Guide to Benefits for details. Extended Warranty doubles the original manufacturer's (or U.S. store brand) warranty and service contract/optional extended warranty where each is 24 months or less. Coverage is for eligible items purchased with your MasterCard. To file a claim online, go to www.mycardbenefits.com. Enjoy exclusive personal assistance with dinner reservations, event tickets, locating hard-to-find items, buying and delivering gifts, and coordinating business-related arrangements**. Knowledgeable experts can assist with whatever you need, whenever you need it — 24/7/365. This takes concierge service to the next level with personalized features that will save you time and simplify your life. Simply call the number on the back of your card. **The cost of goods or services is billed to your MasterCard. Expert Resolution Services: Expert assistance is available to help you 24/7 if you think your identity has been stolen. Call 1-800-MasterCard and you will be assigned a personal certified specialist who will guide you through the process every step of the way. ID Theft Alerts™: This service tracks thousands of websites to identify if your personal information is being bought or sold online. Register now. Emergency Wallet Replacement: Experts assist you in quickly canceling and re-ordering the contents of your physical wallet such as your driver's license, among other items. Call 1-800-Mastercard if you have lost your wallet and would like assistance. ^Rewards are available only for new purchases made with the card: cash advances, checks drawn from the account, and balance transfers are excluded and do not earn credit toward rewards. Certain restrictions may apply. Merchants determine the merchant category code used to identify transactions, which could impact the amount of points you earn. Infuze Credit Union is not responsible for merchant category codes used by merchants. Your card account must be open and in good standing to earn rewards. See Terms & Conditions for more details. 1Accounts approved and issued beginning November 1, 2018, will receive a 10,000 reward point credit upon spending $1,000 in purchase transactions within 3 months of account opening. Cash advances, credit card checks, and balance transfers do not qualify as purchase transactions. Each account is eligible for one reward point welcome offer. Please allow four weeks after spending $1,000 to receive the statement credit. 2APR = Annual Percentage Rate. Qualified borrowers will receive a rate of 2.98% APR for 15 months on balance transfers, after that, 9.38% to 17.38%, based on your credit worthiness. 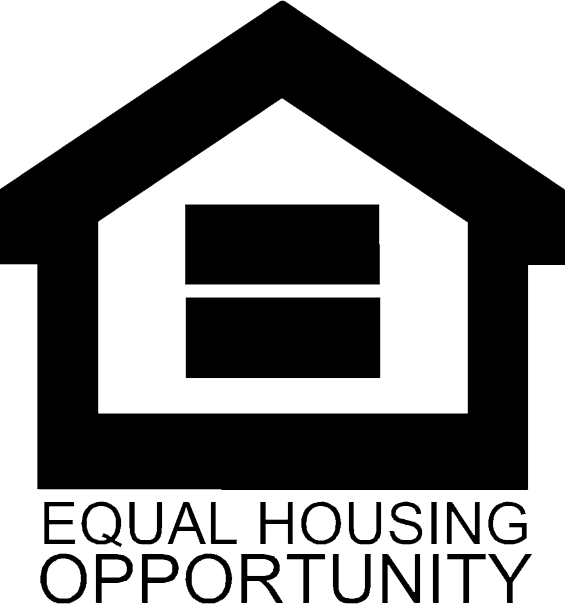 Qualified borrowers will receive an introductory purchase rate of 2.98% APR for 6 months on purchase transactions, after that, 9.38% to 17.38%, based on your credit worthiness. After the intro/promotional period ends, the new APR on outstanding balance transfers and purchases will be the standard balance transfer APR on your account which ranges from 9.38% APR to 17.38% APR depending on your credit worthiness. Please see our Terms and Conditions for rate, fee and other cost information. All terms including the APRs and fees are subject to change at any time for any reason in accordance with the Agreement and Disclosures Statement and applicable law. Rates accurate as of 4/1/2019. Membership required.